So, I already expressed my SHOCK(not) at the idea that the estimated figure that Paulson was asking for was actually and underestimation and the predicted costs would be much higher. So imagine my surprise to find out that Goldman Sachs, where Paulson was formerly CEO, is having an undue influence and an over emphasized benefit in their good buddy Hank's bailout bonanza?! Oh, and they will get more money than anyone else too-- also a shocker. Once again, it is clear that we got a "Brownie" at the helm in a crisis. I have an idea, let's create an Arabian horse show circuit where these guys can all go and work together. They can tour the world with their horses and leave the rest of us alone. More on all things Hank and Goldman at Think Progress. 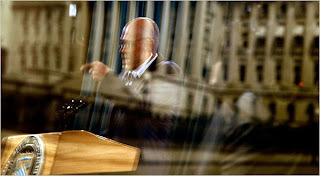 And thanks to Bagnews for pointing out the great ghost like fractured photo of Paulson. Makes me uneasy just looking at it.